"The Crawl to the Naul 2018"
Please note that Club Spins are for current members only. For new members interested in joining, please review the current status of our Members section. 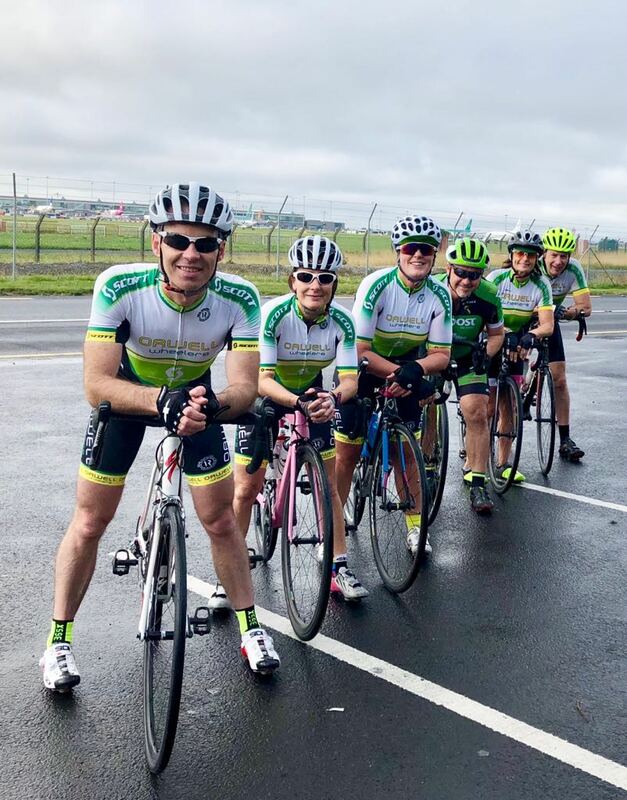 Scott-Orwell Wheelers Cycling Club runs organised weekly Sunday spins which are open to all members from October until March. We also run Saturday spins from April to September. From a competitive point of view, we have our Thursday evening Club League which runs from April to August. There is a Women's specific classification in the Club League. On Tuesdays evenings in early summer, we run the Women's Crit League. On Tuesday evenings in mid-summer, there is the Women's Commission Series. Spins for all levels usually start opposite Joe Daly Cycles in Dundrum. There are occasional groups that will start at the Popes Cross in the Phoenix Park. A link to this year's spin roster will be published in the sidebar. The roster contains maps to the most likely route, including start point, that will be taken on the day by each group as well as a list of group leaders. Staggered starts mean that congestion is minimised and groups can get rolling. The Red groups will be leaving at 9:00am, Orange at 9:10, Yellow at 9:20 and White groups at 9:30 sharp. Must be a current club member & a member of Cycling Ireland/IVCA. Road racing bike in good working order (no mountain bikes, hybrids, straight handlebars or tribars). Quick release wheels, or Bolt Thru-Axles. Tyres and brakes must be in good condition. Pump, tyre levers and two spare tubes are mandatory for road side repairs. Food, water bottle, money and rain jacket. All Scott-Orwell riders are Cycling Ireland members as this covers us from a third party insurance viewpoint. See details about joining and becoming a member at Membership. The numbers meeting on Sunday mornings are now so large that Joe Daly Cycles' carpark is no longer big enough. We will be meeting on the open space under the Luas bridge instead - goo.gl/maps/I8C9y. There is plenty of room under the bridge - please do no stand on the road or block the footpaths. Please remember that there are businesses operating in this area, so be sensitive to customers parking or accessing the shops if they're open. The funeral home is obviously a sensitive one, hopefully there will be no clash on an early Sunday morning with a cortege, but behave accordingly if the occasion arises.